← Stoking the metabolic fire: does higher meal frequency increase metabolism and enhance fat loss? Walter AA, Herda TJ, Costa PB, Ryan ED, Stout JR, Cramer JT. ABSTRACT: The purpose of this study was to examine the effects of two different types of protein supplementation on thigh muscle cross-sectional area, blood markers, muscular strength, endurance, and body composition after eight weeks of low- or moderate-volume resistance training in healthy, recreationally trained, college-aged men. One hundred and six men were randomized into five groups: low-volume resistance training with bio-enhanced whey protein (BWPLV; n=22), moderate-volume resistance training with BWP (BWPMV; n=20), moderate-volume resistance training with standard whey protein (SWPMV; n=22), moderate-volume resistance training with a placebo (PLA; n=21), or moderate-volume resistance training with no supplementation (CON; n=21). Except for CON, all groups consumed one shake before and after each exercise session and one each non-training day. The BWPLV, BWPMV, and SWPMV groups received approximately 20g of whey protein per shake, while the BWP groups received 5g additional polyethylene glycosylated (PEG) leucine. Resistance training sessions were performed three times per week for eight weeks. There were no interactions (p>0.05) for muscle strength and endurance variables, body composition, muscle cross-sectional area, and safety blood markers, but main effects for training were observed (p≤0.05). However, Albumin:Globulin ratio for SWPMV was lower (p=0.037) than BWPLV and BWPMV. Relative protein intake (PROREL) indicated a significant interaction (p<0.001) with no differences across groups at pre, however, BWPLV, BWPMV, and SWPMV had a greater intake than PLA or CON at post (p<0.001). The present study indicated that eight weeks of resistance training improved muscle performance and size similarly among groups regardless of supplementation. It’s common practice for many strength athletes and bodybuilders to consume protein supplements around and even during training. This practice is more or less supported by a growing body of literature over the past 10-15 years that suggests the ingestion of protein both before and after weight training for the purposes of maximizing muscle gain [1, 2]. Today’s article adds to the ever-growing compendium of research on protein supplementation, its safety, and its purported beneficial effects on body composition, muscular hypertrophy, strength, and endurance when added to a structured resistance training (RT) program. This study is conceptually novel in that it also tries to address the issue of optimal training volume alongside supplementation for RT gains. With regards to protein supplement safety, the researchers site some weak data supporting a possible contraindication for supplement usage [3-5]. For those of you who have been following me for the past year know that I have already covered this topic before (i.e. the safety of higher protein diets). For those of you who are newcomers, I suggest you read my thorough examination of higher protein diets from last July. While my article doesn’t address protein supplementation, per se, it does address the majority of safety concerns of higher protein diets on a myriad of health topics. That being said, higher protein intakes are completely harmless unless you already have some preexisting kidney condition. For today, I will limit my analysis to the findings on protein supplementation, protein type, and its effects on body composition, muscular hypertrophy, strength and endurance. I will also briefly touch upon some of the observations on training volume and its effects on strength and muscle size given that it too is a hot topic in exercise science research. In the end, the researchers saw no difference between the three supplement groups or between the supplement groups and the placebo (PLA)/control (CON) groups on improvements in body composition, muscle hypertrophy, strength or endurance. Moreover, they did not see any difference between training volumes on any of the muscular outcomes (i.e. they all got stronger and gained muscle to a similar degree in spite of overall training volume as well as supplement status). It can also be inferred from the study that protein timing, that is, consuming protein immediately after training (as was seen in the intervention groups) offered no further benefit over consuming protein – if at all – at some later point in time (as can be inferred by the lack of immediate protein ingestion after training for the PLA and CON groups). This, however, was not a primary goal of the study and will not be a point of focus in today’s review. Nevertheless, for those interested in the topic of nutrient timing, I would suggest accessing a recent, well-written comprehensive review by friend and colleague, Alan Aragon along with exercise science stud, Brad Schoenfled . Moreover, despite what we already know about higher protein diets and their safety (ala my previous coverage), I should note that the researchers saw no adverse health outcomes (as assessed by various blood bio-markers) associated with the introduction of protein supplementation in conjunction with RT. Go figure. As I’ve already alluded to, the authors wrap up their discussion by stating that, regardless of supplementation status and training volume, all groups showed significant improvements in all muscular outcomes. They also go on to suggest that lower training volume alongside protein supplementation may promote similar outcomes as training with higher volume; something that may be of interest to athletes who are recovering from an injury. I will respond to their conclusions later. This study’s strengths include its rather large sample size (n=106), randomization, the blinding of subjects and researchers, study duration (8-weeks), and concept. In addition, supplementation adherence was tightly regulated, with subjects consuming the protein and PLA supplement in the lab, under the observation of the researchers, 30-minutes before, as well as, immediately following the RT bout. On non-training days, the treatment and PLA subjects were advised to consume 1 packet of the supplement in the morning, in the same manner as they had done in the lab. They were also instructed to return the empty packets in order to ensure compliance (which was, on avg., about 95%). I should also note that the supplementation dosage of 20g of whey protein is highly supported in the literature [2, 7, 8], with estimates ranging from 20-30g of high quality protein as being the “sweet spot,” as it were, for muscle protein synthesis (MPS). The additional leucine (5g) in the “bio-enhanced” groups seems like an exercise in idiocy more than anything else. Despite leucine being the primary dietary stimulus for MPS [9, 10], to my knowledge there is no strong data supporting the addition of leucine to an already adequate amount of protein for the enhancement of MPS. In fact, there is compelling data to the contrary [11, 12]. Either way, each group was receiving an adequate bolus of protein following training. Three-day dietary recalls were also used to evaluate the diets between the groups, although no additional dietary instructions were given to the subjects besides to continue their usual dietary habits. Body composition was measured via hydrostatic weighing (aka underwater weighing), once considered the “Gold Standard” for body composition measurements. Despite more accurate methods out there (most notably DEXA and MRI), there are more error-prone methods (BOPPOD, BIA, skinfolds) that could make this study much worse. Muscle cross-sectional area (CSA) was also ascertained – albeit by a quite novel method that I was unaware of, called peripheral quantitative computerized tomography (pQCT). Based on the literature, pQCT is primarily used for supplemental measurements of bone mineral density alongside DEXA, although it has been recently validated for measurements of muscle CSA and proves to be quite reliable . Therefore, given the training status – or lack thereof – of the subjects, any results can only be applied to healthy, young, untrained and/or entry-level weightlifters. This is contrary to how the authors try to extrapolate their findings with regards to recommendations for athletes (tisk tisk). Another disparaging limitation of the study was the failure to control for dietary/protein intakes. Case in point, failing to control for overall protein intakes led to a wide range of intakes between the groups (0.69-2.86g/kg bodyweight), with the PLA and CON groups leaning more towards the lower end of the range (0.69-1.96g/kg) and the supplement groups comprising the upper end (1.04-2.86g/kg). Nevertheless, given the subject’s baseline weights (ballpark avg. of 78kg or ~172lbs), the supplement groups were taking anywhere from ~80-225g of protein and the PLA and CON groups were slightly worse off with intakes ranging from 53-152g/day. So in other words, the researchers were looking at a clusterf***k of overlapping protein intakes, ranging from terrible to more-than-adequate, both inter- and intra-group-wise. Basically, some subjects that were receiving the supplement were getting less protein per day than some subjects not receiving the supplement at all. This could be another reason why no differences were seen between supplement and non-supplement groups. 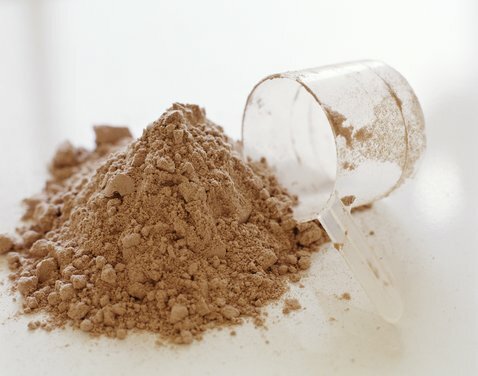 Given the totality of information from the present study, most notably the untrained status of the subjects and the failure to control for protein intakes, we just can’t conclude that protein supplementation is worthless in the context of a sufficient, high-quality protein diet along with a structured RT program for intermediate to highly trained athletes/weightlifters. Probably the closest thing we have to an answer is a recent meta-analysis looking at protein supplementation and increases in muscle accretion and strength in a wide range of lifting populations . In the end, however, protein supplementation’s beneficial effects may only apply to those hitting the lower end (1.2g/kg) of the recommended protein intake for strength/power athletes. This, however, probably has more to do with increasing overall intake rather than supplementation, per se. In regards to protein type, I’m also not quite sure what the researchers were hoping to find by using leucine-enriched whey as the secondary supplement. The subjects were already receiving a bolus of whey protein which is to be considered adequate for muscle protein synthesis. Indeed, in 2009, Moore et al. found that muscle protein synthesis displayed a dose response relationship to dietary protein ingestion, topping out at around 20g, while multiple studies by Koopman et al. have shown no benefit of additional supplemental free leucine when a sufficient amount of casein-hydrolysate was ingested post-workout [11, 12]. So, despite hopes of seeing differences in protein type, the results were doomed from the start. Instead, I would like to have seen a whole food source or something else vs. whey that might be of real-life significance and applicability. My hunch, however, is that it won’t matter in the long run as long as the whole food source is of high-quality protein (i.e. high in leucine and EAAs). This may be of some concern to those who are vegetarian and tend to be lacking in high-quality protein sources. In this case, whey would be a great addition to cover all their bases. As far as training volume and strength/hypertrophy is concerned, it would be presumptuous to argue that, based on this study, increased training volume has little to no benefit on muscular outcomes when compared to fewer sets and therefore lower overall volume. In probably the most well-controlled study of its kind, Marshall et al. reported greater increases in 1RM strength on the squat in an 8-set/exercise group compared to a 1-set/exercise and 4-set/exercise group after 10 weeks of squat training . What’s even more compelling about this study is that the 8-set/exercise group started out stronger than the 1-set and 4-set/exercise group yet still increased their 1RM by MORE than the 1-set and 4-set group. Let that sink in for a second… Despite being stronger from the start, the 8-set group got stronger, relatively, than the people who started out weaker. Usually, those who are weaker and less trained have the most to gain and, relatively, gain more strength than those who are already strong to begin with. In addition, only the 8-set group got significantly stronger in the squat after 3 weeks, showing an immediate effect of volume on strength gains. This has implications for those athletes trying to get stronger within a finite period of time. Either way, a growing body of evidence suggests that if you want to get bigger and stronger, you should increase your volume (i.e. do more sets) [16-21]. In the end, this study tells us nothing that we don’t already know; put novice trainees on a structured RT program and they’ll get bigger and stronger and improve their body composition. Shocker! Unfortunately, a poor research design made this study virtually useless to examine the practical effects of protein supplementation on muscular outcomes in athletes and weightlifters. Nevertheless, regardless of this study, logic dictates that protein supplementation will never be necessary in the face of already sufficient protein intakes (assuming there is an emphasis on high quality proteins, rich in leucine and EAAs); an assumption this is supported by a recent meta-analysis . As it stands, current recommendations for protein intake for strength and power athletes range from 1.2-2.2g/kg of bodyweight [22-26]. Furthermore, in a well-written review by Kevin Tipton and Robert Wolfe , the authors note that protein intakes as high as 3.0g/kg aren’t harmful and may even be of some benefit to the athlete, while a more recent study showed that, in Korean bodybuilders, habitual intakes of ~4.3g/kg had no adverse health effects . Nevertheless, regardless of overall intake, the most salient point Tipton and Wolfe make, and one that I happen to agree with above all else, is that, as long as protein intake doesn’t hinder the intake of other macronutrients (carbs/fats), there’s no reason not to consume higher amounts of protein (even up to 3-4g/kg although this is not necessary by any stretch) given that there is no inherent harm, even at the more “extreme” intakes. So, in the end, if you’re already taking in adequate, or even more than adequate amounts of protein on daily basis, without extra protein supplements, don’t waste your money. I am unaware of any studies comparing chronic whole food vs. protein powder consumption in conjunction with a training regimen. Moral of the story: if you find that whey protein (or whatever powder you choose) is easier and more convenient than firing up the grill or slaving over a hot stove pre- and post-workout, than by all means, hit the powder. Personally, I enjoy the taste and love portability of whey protein powder (just shake and drink). Preferences aside, the key thing to remember is that there is nothing magical about protein supplementation, despite what the supplement companies are telling you. As of now, all it is is a way to further augment your total dietary protein intake, which, in the end, is all that matters. 1. Cermak NM, Res PT, de Groot LCPGM, et al. Protein supplementation augments the adaptive response of skeletal muscle to resistance-type exercise training: a meta-analysis. Am J Clin Nutr. 2012;96(6):1454-64. 2. The science of muscle hypertrophy: making dietary protein count. Proc Nutr Soc. 2011;70:100-103. 3. Brenner BM, Meyer TW, Hostetter TH. Dietary protein intake and the progressive nature of kidney disease: the role of hemdynamically mediated glomerular injury in the pathogenesis of progressive glomerular sclerosis in aging, renal ablation, and intrinsic renal disease. NEJM 1982;307:652-659. 4. Martin WF, Armstrong LE, Rodriguez NR. Dietary protein intake and renal function. Nutr. Metab. (Lond) 2005;2:25. 5. Metges CC, Barth CA. Metabolic consequences of a high dietary-protein intake in adulthood: assessment of the available evidence. J Nutr. 2000;130:886-889. 6. Aragon AA, Schoenfeld BJ. Nutrient timing revisited: is there a post-exercise anabolic window? JISSN 2013;10(1):5. 7. Moore DR, Robinson MJ, Fry JL, et al. Ingested protein dose response of muscle and albumin protein synthesis after resistance exercise in young men. Am J Clin Nutr. 2009;89:161-8. 8. Symons TB, Sheffield-Moore M, Wolfe RR, Paddon-Jones D. A moderate serving of high-quality protein maximally stimulates skeletal muscle protein synthesis in young and elderly subjects. J Am Diet Assoc. 2009;109:1582-1586. 9. Stipanuk MH. Leucine and protein synthesis: mTOR and beyond. Nutr Revs. 2007;65(3):122-129. 10. Drummond MJ, Rasmussen BB. Leucine-enriched nutrients and the regulation of mammalian target of rapamycin signaling and human skeletal muscle protein synthesis. Curr Opin Clin Nutr Metab Care 2008;11(3):222-6. 11. Koopman R, Wegenmakers AJM, Manders RJF, et al. Combined ingestion of protein and free leucine with carbohydrate increases postexercise muscle protein synthesis in vivo in male subjects. Am J Physiol Endocrinol Metab. 2005;288(4):E645-53. 12. Koopman R, Verdijk L, Beelen M, et al. Co-ingestion of leucine with protein does not further augment post-exercise muscle protein synthesis rates in elderly men. Br J Nutr. 2008;99(3):571-80. 13. Cramer T, Palmer IJ, Ryan ED, et al. Validity and reliability of a peripheral quantitative computed tomography scanner for measuring muscle cross-sectional area. Med Sci Sports Exerc. 2007;39:S225-S226. 14. Cermak NM, Res PT, de Groot LC, et al. Protein-supplementation augments the adaptive response of skeletal muscle to resistance-type exercise training: a meta-analysis. Am J Clin Nutr. 2012;96(6):1454-64. 15. Marshall PWM, McEwan M, Robbins DW. Strength and neuromuscular adaptation following one, four, and eight sets of high intensity resistance exercise in trained males. Eur J Appl Physiol. 2011;111:3007-3016. 16. Rhea MR, Alvar BA, Burkett LN, et al. A meta-analysis to determine the dose response for strength development. Med Sci Sports Exerc. 2003;35(3):456-464. 17. Peterson MD, Rhea MR, Alvar BA. Maximizing strength development in athletes: a meta-analysis to determine the dose-response relationship. J Strength Cond Res. 2004;18(2):377-382. 18. Wolfe BL, LeMura LM, Cole PJ. Quantitative analysis of the single- vs. multiple-set programs in resistance training. J Strength Cond Res. 2004;18(1):35-47. 19. Krieger JW. Single versus multiple sets of resistance exercise: a meta-regression. J Strength Cond Res. 2009;23(6):1890-1901. 20. Krieger JW. Single vs. multiple sets of resistance exercise for muscle hypertrophy: a meta-analysis. J Strength Cond Res. 2010;24(4):1150-1159. 21. Wernbom M, Augustsson J, Thomeé R. The influence of frequency, intensity, volume and mode of strength training on whole muscle cross-sectional area in humans. Sports Med. 2007;37(3):225-64. 22. Tipton KD, Wolfe RR. Protein and amino acids for athletes. J Sports Sci. 2004;22(1):65-79. 23. Wilson J, Wilson GJ. Contemporary issues in protein requirements and consumption for resistance trained athletes. JISSN 2006;3:7-27. 24. Rodriguez NR, DiMarco NM, Langley S, et al. Position stand of the American Dietetic Association, Dietitians of Canada, and the American College of Sports Medicine: nutrition and athletic performance. JADA 2009;109(3):509-27. 25. Kreider RB, Campbell B. Protein for exercise and recovery. Phys Sportsmed. 2009;37(2):13-21. 26. Campbell B, et al. International Society of Sports Nutrition position stand: protein and exercise. JISSN 2007;4:8. 27. Kim H, Lee S, Choue R. Metabolic responses to high protein diet in Korean elite bodybuilders with high-intensity resistance exercise. JISSN 2011;8:10. Thanks for the insights and thorough lit review. Yeah, it’s a shame, this study seemed to hold such promise (8 weeks, n>100, multiple interventions, etc.) – but failed in such a critical manner – poor nutrition controls. Similar to background training status, it just seems like controlling for diet would’ve been an obvious thing to prioritize. It pains me to read studies like this. Glad to hear you’re enjoying my blog! It always a pleasure to hear from my readership. As far as suggestions, I would just say to not be afraid to put yourself out there. Creating this blog was one of the best decisions I’ve made within the past year, and I’ve had a blast posting and talking with others who read my posts. Find something that you’re truly passionate about and you can’t go wrong. The best of luck, Roger!